I truly love this dish for meatless Mondays, but then I can make it any other day of the week with the ground beef!!! So totally yummy sounding!! 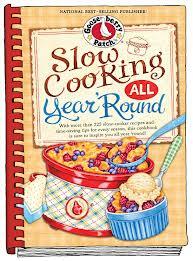 This is truly the one cookbook I so wish I could win because cooking in my slow cooker is my favorite past-time. Thank you for this opportunity, and I am now following your blog. I would love to get this cookbook and try out all the great recipes!! Being a working mom, my husband (retired) and teen aged homeschooler are becoming quite fond of the crockpot recipes. We would love to have some more recipes to try. So I'm assuming "oven-ready lasagna noodles" are different than regular lasagna noodles? I've always heard about making lasagna without actually cooking the noodles first, but have never had the guts to try it. Would love to see the rest of the recipes in this cookbook! Love using my crockpot for meals. Could use more recipes .... especially from Gooseberry Patch. I have this recipe in the crock pot right now! I have a little shopping to do so off I go knowing dinner is in the making... lasagna!!! I would enjoy adding Slow Cooking All Year Round to my collection. This sounds great! Love Gooseberry Cookbooks and hope to win this one. Thanks for the chance.